The following is a play I've been using of late on players towards the middle of the market that I perceive should be higher. 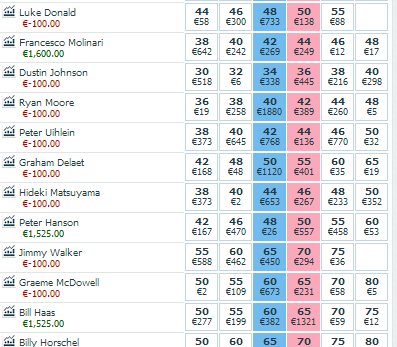 I often refer to the word "flip" as early on in tournaments I'll find a lot of them replace the market leaders. As such, I've been working on the best strategy to take advantage of small to larger positions on this. Open a Betfair account here and try this strategy for yourself. 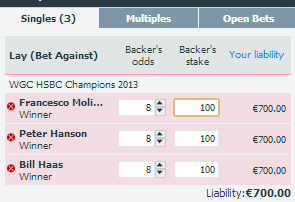 What I do then is I place a lay order on each of those three players for the full €100 outlay so if any of them hit those target odds, we are free rolling. Make sure to tick the "keep at in play" box. From years of experience I know pretty much exactly what needs to happen in terms of scoring for these odds to be hit. Again, I'll go into this in detail in my Ebook but for now, I'd be hoping one of them may hit 8.0 in-play in round 2, all going well. I generally review after 36 holes and this is where the strategies can become a little ambiguous for want of a better word. There are generally a few options at this point and it simply comes down to your own style as to how you want to proceed. Sometimes all three will have bombed out so there's nothing you can do, sometimes there may be the potential to take your £100 back or exit for a % of your initial liability. Sometimes two of your 3 may have hit the target 8.0 odds and you've already doubled your money and your book looks fantastic and already with the option to exit for a heavy profit.